Leadership has always been an interesting topic to me because it has so many facets. I have heard many amazing presentations on leadership from local community leaders to renowned international leaders. I have had countless opportunities to serve as a leader personally, professionally, and spiritually. Various aspects of leadership have surrounded me all my life. No matter where you go or whom you talk to, most people would agree that leadership starts with a great foundation. When it comes to leadership, some things never change. The strategic way of communicating and influencing others with your leadership principles may change, but the foundation of leadership never changes. This is so important, let me say it again. It may be hard to believe this statement, but it is true. It holds true to leadership of any form. Everything in life has a foundation. If you don’t think so, try building a house without a foundation. Better yet, try playing any sport without learning the basics of the game. Many times in life, we know where we want to be, but we sometimes are impatient about getting there. 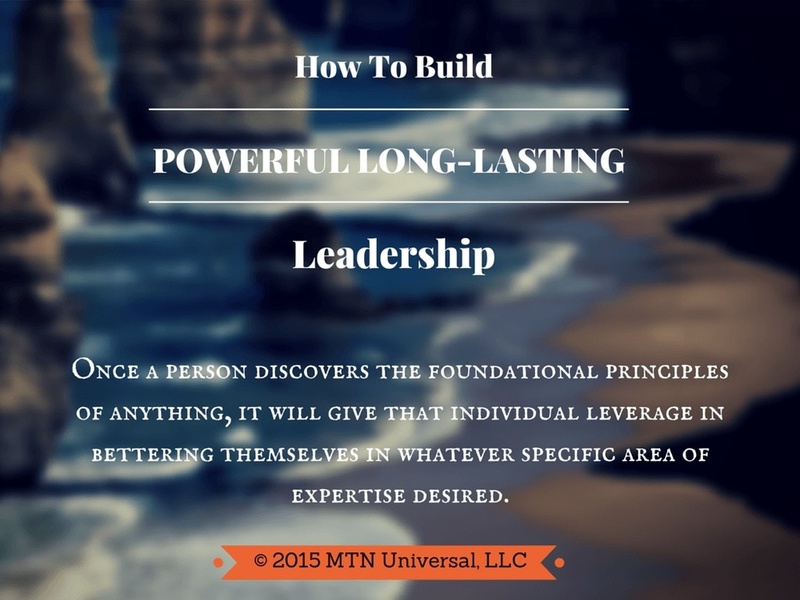 So today I want to give you a few tips on building powerful long-lasting leadership. Once a person discovers the foundational principles of anything, it will give that individual leverage in bettering themselves in whatever specific area of expertise desired. There is no difference when it comes to leadership. Growth and development as a leader occurs with a great foundation. A foundation can be either shallow or deep. As leaders, we determine the construct of our foundation. The deeper our foundation, the better we will be as a leader. If we build a shallow foundation, we set ourselves up to be shallow leaders. There have been many philosophies and ideologies to come and go regarding leadership, but there are two steps to building powerful long-lasting leadership. God is the foundation of all things because he is the Creator of all things. Whether you believe it or not, God can promote and prosper your desires as a leader. For years, people have always sought out the best people in their respective fields to discover ways of bettering themselves. It has always been a great idea to find the best and learn from that person. I don’t know anyone more qualified to help your leadership other than God. God has seen the rise and fall of many great leaders. He knows all things, so who wouldn’t consult with Him? The next step to giving your leadership life is by giving your family life. I know it is a scripture that speaks in regards to leading a church, but I think it can apply to anyone leading anyone from churches to any business organization. You may be curious about how it all applies. If a person lacks compassion, optimism, vision, insight, and care with leading his or her family, it will be very difficult to lead anyone else. There are no perfect families, just like there are no perfect businesses. A leader must be able to handle different personalities, learning levels, and gifts. Invest in your family and it will make you a better leader in every way. Whatever you do, build the right foundation with your leadership. Seek God and invest in your family. Question: In what ways can you apply these principles to help you with your leadership? Leave your comments below.